In the aviation photography world however, this is a bad thing. We want prop blur to convey to the viewer a sense of motion, which then gives the picture the proper context of the aircraft is flying and not just sitting up in the sky. So how do we fix this? Well in general, you will want your shutter speed to be no faster than 1/160 of a second to capture prop blur. The slower the shutter speed, the more you get away from the dreaded “Popsicle Sticks.” Ideally, you are going to want the shutter speed to be less than 1/125 of a second. How close you come to “Full Disk” (where the prop blur looks like an uninterrupted circle) is going to depend on the engine type (inline vs. radial), the current RPM of the engine and your shutter speed. So you will have a better chance at getting full disk on take-off or a high speed pass, where the RPM is at its highest. 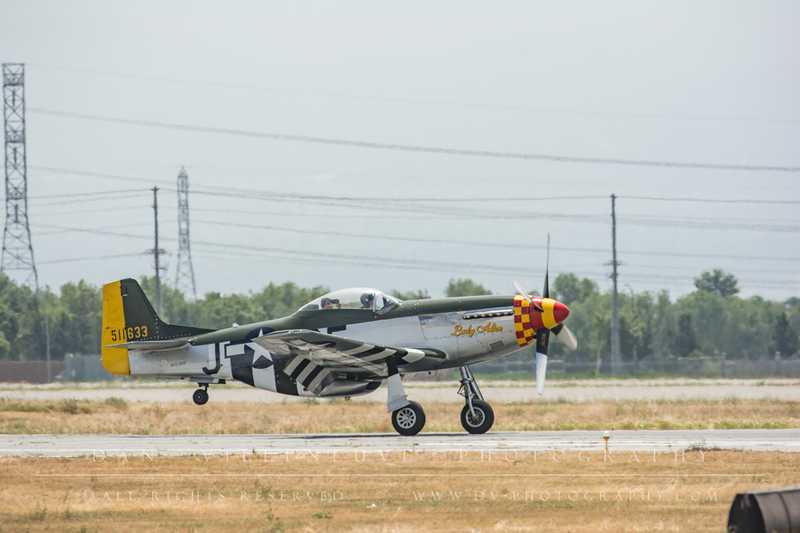 And typically, inline engines (like the Rolls Royce engines on P-51 Mustangs) usually run at a higher RPM in general compared to radial engines (like on F4U Corsairs). Faster RPMs mean you don’t have to set the shutter speed as slow to achieve the same amount of prop blur. So this should be easy, right? Well here’s the catch. Go back to the rule of sharpness we talked about earlier; double the focal length and set your shutter speed to that. Most often, when shooting ground to air shots, you are using a super-telephoto lens, where you are well beyond 200mm. Apply the rule at 200mm and you should be shooting at least 1/400 second. That’s a pretty big difference in shutter speed to the desired 1/125 sec or less (and even greater when you use longer focal lengths, like 400mm or 600mm). So chances are you’re going to be having a difficult time to get the plane in focus and show prop blur at the same time. 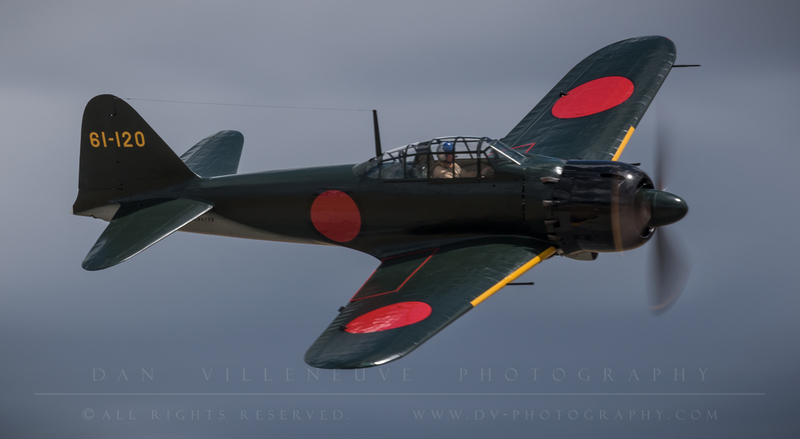 The Planes of Fame’s Mitsubishi A6M5 Reisen (#61-120) flies past the crowd. Shot at 1/125 second @ 300mm. 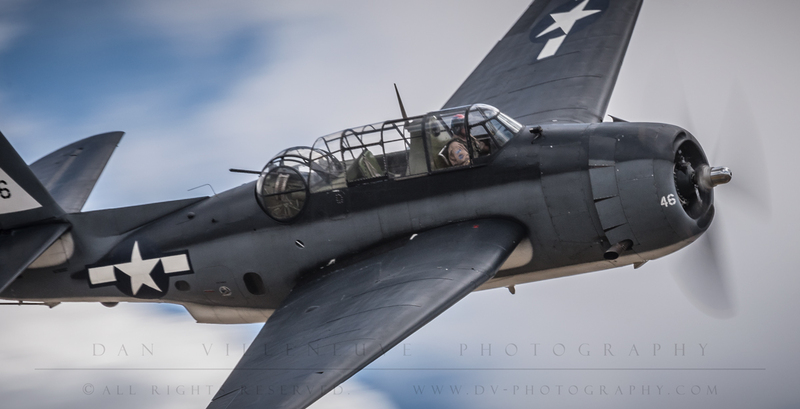 Scott Turner taxies the Planes of Fame’s Grumman/General Motors TBM-3E Avenger (Serial #: 91264) past show center. Shot at 1/125 sec @ 300mm. 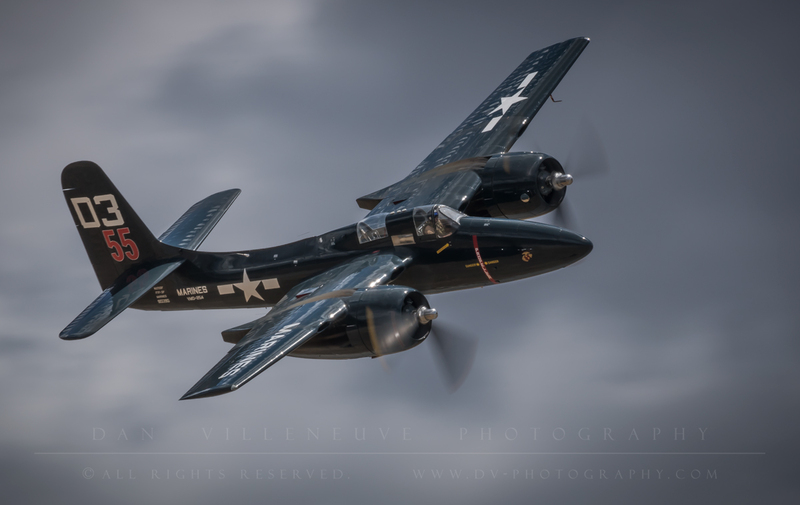 In the aviation photography community, when a group of us get together at airshows, we sometimes like to have fun with it and set up a challenge to only shoot at a certain shutter speed or slower. Typically, this starts out at 1/80 sec. Because who doesn’t like to make things as challenging as possible? So the next time you see a tack sharp image of a vintage aircraft in flight with a good amount of prop blur, keep all this in mind. I have a bunch of respect now for those aviation photographers! I hope this sheds some light on the challenges of aviation photography. Thanks for reading! This entry was posted in Photo Shoots, Technique. Bookmark the permalink.